About "Markup and markdown word problems answers"
"Markup and markdown word problems answers" is an important category of percentage problems. First let us understand what is mark up and mark down. To get profit in a business, a trader increases the cost price and sells the product. This increment in price is called as "Mark up"
This "Mark up can either be in percent or in dollars. To increase the sale, stores will decrease the price of a product by giving offer or discount. This offer or discount is called as "Mark down". This mark down can either be in percent or in dollars. 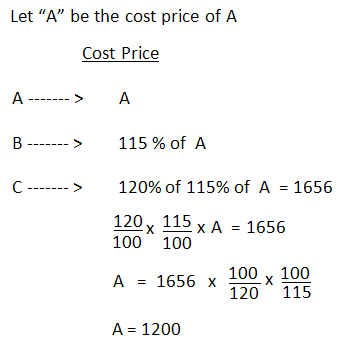 To do mark up and mark down word problems answers, let us go through the hints related to "Markup and Mark down"
Cost price and marked up percentage are given. List price and marked down percentage are given. List price price and marked down value (in dollars ) are given. Cost price and selling price are given. To have better understanding on "Markup and markdown word problems answers", let us look at some examples. 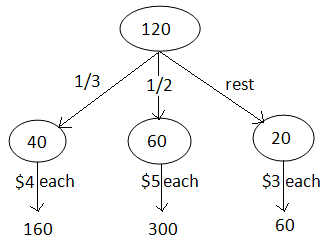 Let us look at the next example on "Markup and markdown word problems answers"
A trader cheats his customer to make a profit by stating that he sells at cost price but gives his customers only 800 grams. for every 1000 grams. What is the mark up rate? Mr. Lenin sold a chair at a loss of 15%. If he had sold at a mark up rate of 10%, he would have got $100 more. What is the cost is the cost price of the chair? If good are purchased for $ 1500 and one fifth of them sold at a loss of 15%. Then at what mark up rate should the rest be sold to obtain a overall mark up rate of 15% ? As per the question, we need 15% mark up rate on $1500. When all the good sold, we must have received $1725 for 15% mark up rate. When we look at the above picture, in order to reach 15% mark up rate overall, the rest of the goods ($1200) has to be sold for $1470. Hence, the rest of the goods to be sold at the mark up rate of 22.5% in order to have the mark up rate of 15% overall. By selling 20 articles, a trader gained the selling price of 5 articles. Find the mark up rate. A trader marks his goods 20% above the cost price and allows a discount of 10% for cash. Find the mark up rate. A person wants to get 20% mark up rate after selling his object at 20% discount. Find the required percentage increase in marked price. A person buys 8 articles for $15 and sells them at 10 for $18. 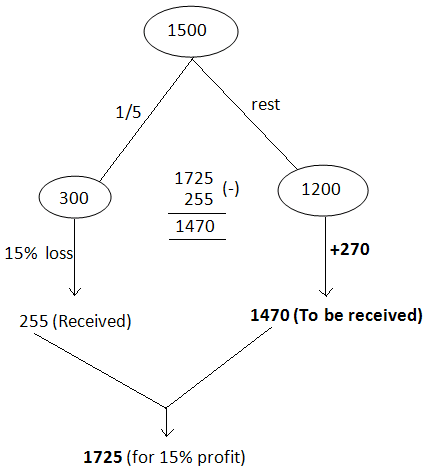 Find the gain or loss percentage. Sum of the cost price of two products is $50. Sum of the selling price of the same two products is $52. If one is sold at 20% and other one is sold at 20% loss, find the cost price of each product. Here we have have listed out all the shortcuts which are required to solve profit and loss problems. Students can solve any word problem on profit and loss using the shortcuts which have been explained above. Do you need the shortcuts explained above as pdf document?